Some federal lawmakers want to make it easier for on-demand workers to get health insurance, retirement and other portable benefits, mirroring efforts already going on in some states. The rise of the on-demand economy, popularized by companies such as ride-share giants Uber and Lyft, has lawmakers questioning workplace protections and seeking ways to fill the void of benefits offered to traditional employees. On-demand or “gig” workers are often treated as independent contractors who usually are not offered benefits and don’t get minimum wage, overtime and workers’ compensation protections. Gig businesses are typically hesitant to offer benefits, at least partly because they fear it would make courts and regulatory agencies more likely to find that contractors should be classified as employees. That’s why Sen. Mark Warner (D-Va.) is expected to soon introduce legislation that would use a Labor Department grant program to help nonprofits and local governments experiment with portable benefits for gig workers. The measure comes as lawmakers in states like Washington, New York and New Jersey are already starting to think about what those programs would look like. Freelancers Union estimates about 55 million Americans—or 22 percent of the working-age population—are involved in on-demand work. Research by economists Alan Krueger of Princeton University and Larry Katz of Harvard University, using Bureau of Labor Statistics methodology, concludes 16 percent of workers are in gig jobs, while a Federal Reserve survey found the share was more like 36 percent. Farrell’s proposed legislation, drafted with help from venture capitalist Nick Hanauer and a Service Employees International Union local, would have companies pay into a nonprofit fund to provide benefits for gig economy workers. Companies would be required to allot the lesser of 25 percent per customer transaction with a worker or $6 for every hour on the job to the benefits plan. A similar bill was recently introduced in New Jersey by Assemblyman Troy Singleton (D). Online home-cleaning company Handy is among a group of sharing economy businesses that have been talking with New York State lawmakers about possible legislation that would provide workers with portable benefits. The efforts have been met with criticism from another SEIU local—32BJ—which says the draft measure currently making the rounds would erode worker protections by classifying more employees as independent contractors. “32BJ SEIU and many other unions and community groups were very concerned when they learned companies were pushing legislation in Albany that would deny a large and growing category of workers their rights as employees in exchange for marginal benefits,” union president Hector Figueroa told Bloomberg BNA May 5. The New York bill comes as Gov. Andrew Cuomo (D) is forming a task force to see how the state can create measures for portable benefits. Warner’s bill would come amid calls for the federal government to tweak employment tax and worker classification laws. Both Democrats and Republicans have talked generally about updating federal laws such as the Fair Labor Standards Act, which offers minimum wages and overtime pay protections, to create a third category. Although Warner has led the charge on portable benefits, House Workforce Committee Chairwoman Virginia Foxx (R-N.C.) has also expressed interest. Any adjustment of federal laws is likely to take time, according to gig economy advocates such as Gene Zaino, president of self-employed business service provider MBO Partners. 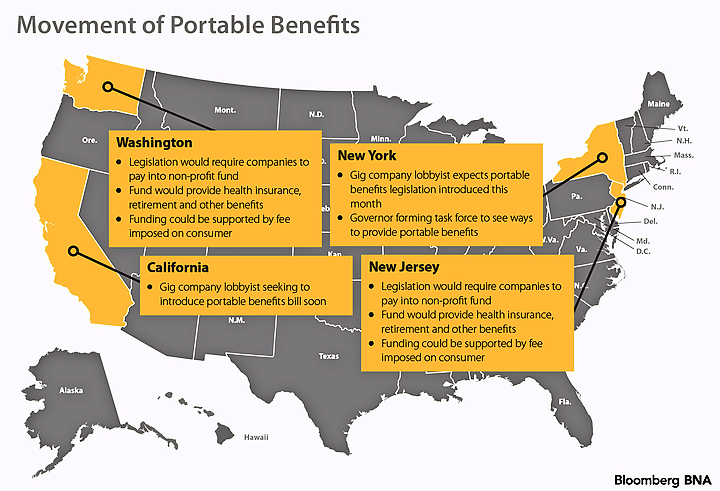 Zaino said the portable benefits model is a “good idea to experiment and learn from it,” but the larger issue deals with adjusting federal laws. For years, there have been some measures to offer portable benefits for some workers, protections that follow them from job to job. That includes the multiemployer benefit plans that some unions have negotiated with construction and entertainment businesses. An example includes the building trades unions in the 1950s when carpenters worked for multiple contractors. Other versions include the Black Car Fund, a nonprofit organization created in 1999 to provide wages and medical benefits for black car and limousine drivers injured on the job in New York. The protection is paid by a fee added to the ride fare. Warner’s concept could mirror the DOL’s previous use of grants to spur innovation. The agency in July 2016 announced a new $100,000 grant for nonprofits to experiment with portable retirement benefits for workers such as independent contractors. Warner is the co-chairman of the Aspen Institute’s Future of Work Initiative. Experiments to provide a larger scale of portable benefits for the workforce is welcomed by gig employers like Lyft. Farrell’s proposed legislation for Washington state did not move out of committee this legislative session. The proposal will take more time, she told Bloomberg BNA. Lawmakers in New York are planning in the coming weeks to introduce a bill that would allow gig businesses to contribute to portable benefits programs for independent contractors without facing the legal responsibility that comes with being a full-blown employer under state law, Bradley Tusk, an investor in home cleaning company Handy, told Bloomberg BNA. The bill would also update the legal line between independent contractors and employees. It’s unclear exactly how the bill would define independent contractors, but some labor groups are concerned that it will greatly expand the group of workers who fall in that category. The measure, sponsored by New York Assembly Majority Leader Joseph Morelle (D), is being pushed by a coalition of gig employers that includes Handy, Instacart, GrubHub, TaskRabbit, Postmates and StoreDash, according to Tusk. The bill does not dictate how those plans would be funded, Tusk said. “Denying current and future gig economy workers employee status would deprive untold millions of New Yorkers of many protections and rights, including the right to organize in a union, the right to collect unemployment and many workplace health and safety protections,” he said. —Chris Opfer contributed to this story.